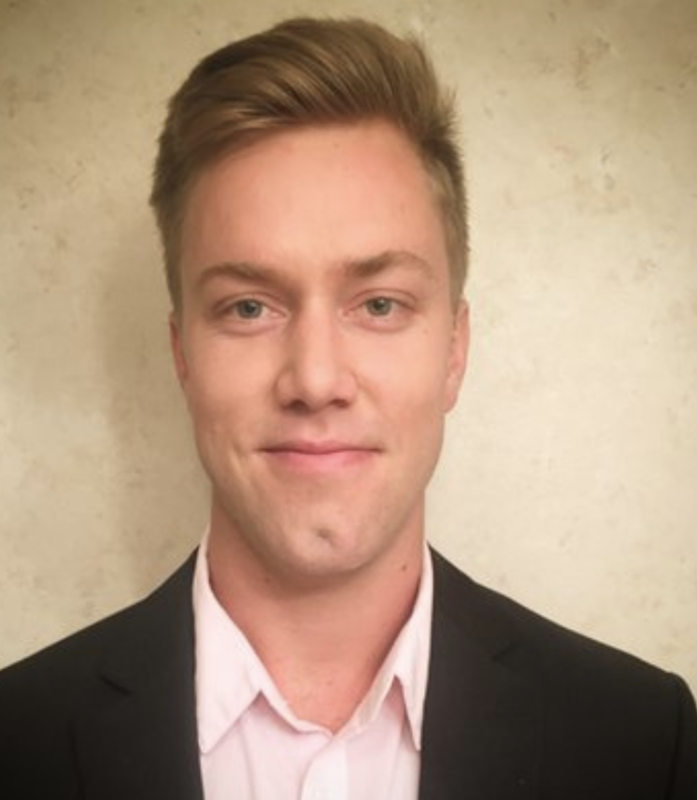 Alex Sunnarborg is the founder of Lawnmower, a blockchain investing and market data platform founded in 2015. In this opinion piece, Sunnarborg compares bitcoin’s attributes with those of the newly launched cryptocurrency Zcash, providing an overview of how he considers the market potential of each . With the launch of Zcash today (and the speculation surrounding it) you may be wondering how the decentralized, open-source cryptocurrency compares to bitcoin, the original digital currency. While many structural similarities to Satoshi Nakamoto’s bitcoin design are obvious, Zcash utilizes advanced new cryptographic techniques to offer optional improved privacy and transparency, as well as its own unique blockchain. But, despite the differences, there is common ground. 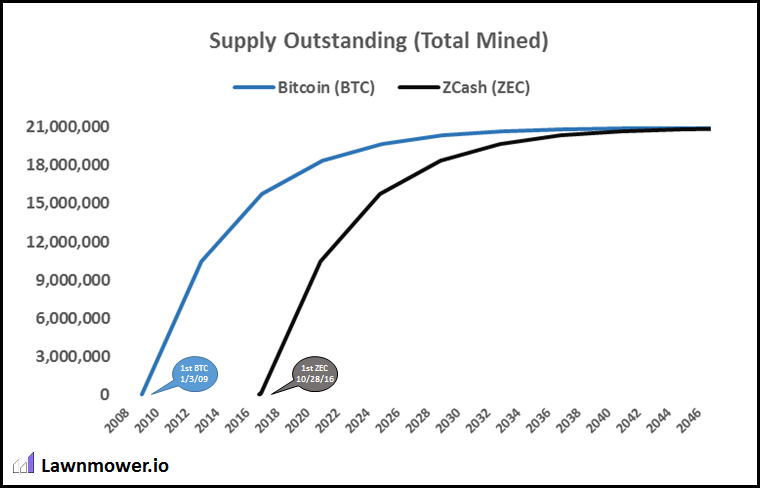 Zcash’s supply model is extremely similar to bitcoin’s, with a fixed and known issuance model that is cut in half approximately every four years. 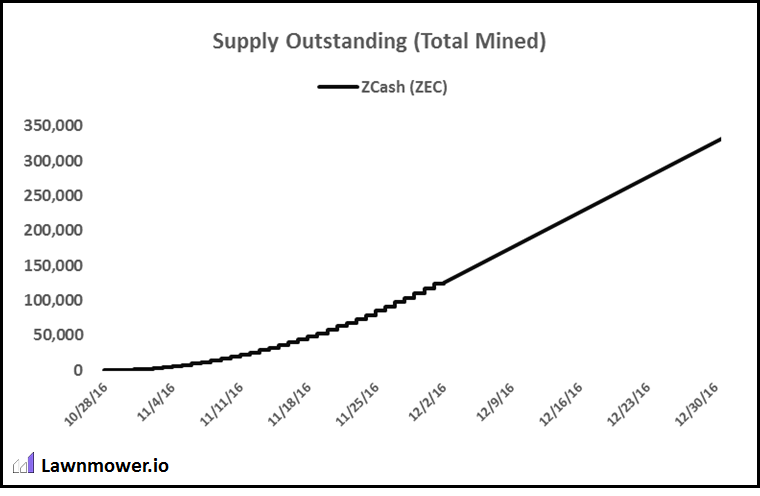 As well, there is a maximum of 21m units of both Zcash (ZEC) and bitcoin (BTC) which will be mined over time. Given these similarities, it’s easy to see why the price and market caps of the two assets are often compared. Nearly eight years after bitcoin’s genesis block was formed, more than 15.75m BTC have already been mined (representing over 75% of the supply that will ever exist on its blockchain). Zcash’s developers are now standing by to launch a similar cryptocurrency, albeit with some key differences. Small changes to the blockchain and issuance structures mean ZEC will have a 2.5-minute average block time and an initial block reward of 12.5 ZEC. There will also be a “slow-start” period during the first 20,000 blocks (about 34 days) where the block reward linearly increases to 12.5 ZEC. This is designed to reduce the impact of a potential negative event like “a major bug” or “security vulnerability”. As a result, the first blocks will reward extremely small amounts of ZEC, meaning the overall supply in the ecosystem will be limited as the block reward ramps up. Despite this, exchanges including Kraken and Poloniex have already announced they will be opening markets as soon as possible following the distribution of the first fractions of coins to miners and the network. As you can imagine, early exchange order books will likely display many buy orders for large quantities. The only initial sell orders will be small, as those first reduced block rewards are issued. In the days before its launch, derivatives exchange BitMEX already has a form of Zcash market open for traders before the first ZEC has even touched its blockchain. The futures contract it offers expires in about two months, on 30th December, and is based on the price of ZEC on that date as compared to bitcoin. The BitMEX price is currently 1.5 BTC, representing the market’s expectation that 1 ZEC will be worth 1.5 BTC on the above date, by which time about 330,000 ZEC will have been mined. At bitcoin’s current price of $685, a ZEC price of 1.5 BTC would imply a market cap of about $350m, which would make it one of the top five digital assets. Of course, the demand side of the market may be willing to pay a higher price per unit of BTC than ZEC on 30th December, but the psychological impact of the pair reaching parity is undoubtedly noteworthy. Additional trading has already also occurred in a form entirely different than anything seen in bitcoin’s anonymous and decentralized issuance structure. Zcash was created by a public team and company (Zcash Electric Coin Company) with a slew of additional high-profile employees, advisors and investors. 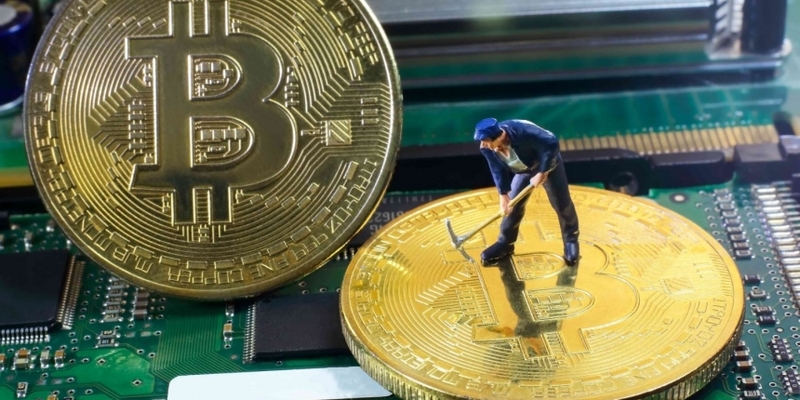 As additional incentives beyond equity in the company, many of these team members are also set to receive a portion of future ZEC block rewards in the mining process. Ten percent (2.1 million) of the 21 million ZEC to ever exist are set to be allocated to groups outside of the miners who successfully place a new block on the ZEC blockchain. Investors, employees, advisors, founders, the company (“as a ‘strategic reserve’ to fund new projects”) and the non-profit Zcash Foundation (created to “maintain and improve the Zcash protocol in the interests of all users, present and future”) are all set to receive a specified portion of future block rewards over specified time periods. The 2.1m ZEC will all be distributed over the first four years, and up until the point where 10.5m ZEC will have been mined, thus representing a distribution of 20% to parties other than miners. 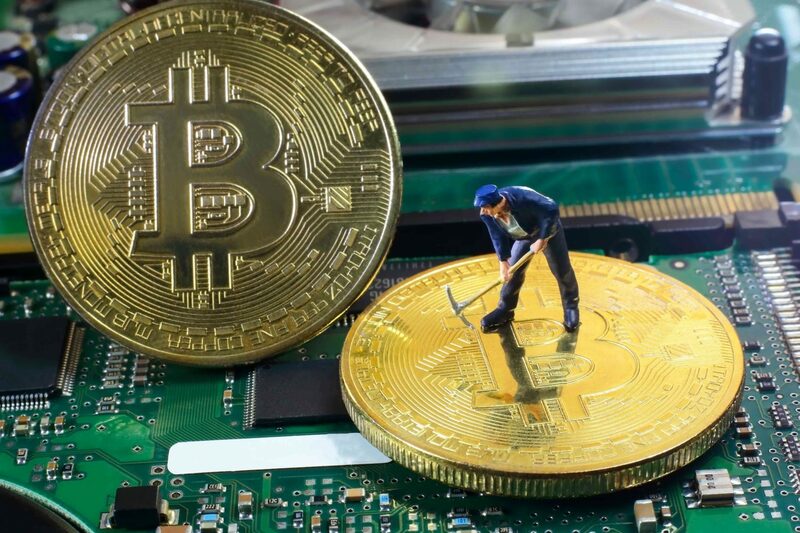 After the first four years, the further 10.5m coins to be mined will be rewarded solely to miners.